Every overhead door will eventually succumb to wear and tear and end up breaking down. However, the longevity of such a complex system can be drastically extended with the right maintenance routine. Our garage door technicians specialize in performing a wide variety of tasks that can guarantee your door lives up to its full potential. Spring adjustment can be dangerous, especially when performed by armatures. However, it is a necessary part of a regular maintenance routine that can positively affect the condition of both your springs and your system as a whole. It will prevent these components from overstraining by making sure their weight and tension is properly distributed, and it will also make sure that your door continues to open evenly and doesn't get unbalanced. 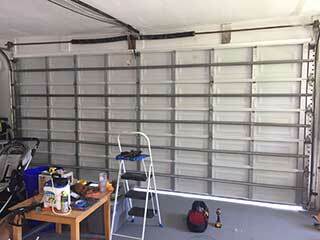 Another key aspect of our garage door maintenance service is focusing on the electric opener unit. We will lubricate the drive-system and adjust the chain (if it is a chain-drive, of course). We'll also test the automatic reverse features to make sure the door is safe to use. Your opener safety sensors must be positioned correctly in order to adequately detect an obstacle. You can count on our team to carefully realign these photoelectric eyes and make sure that their lenses are in a good working condition. Sensor realignment is a delicate process, so you should always leave this type of task to our specialists. Your tracks are in charge of housing the rollers and guiding their movement, and they, in turn, maneuver the door along the tracks. The relationship between the two types of components is therefore critical in order to avoid a situation where the door gets off track. We'll lubricate the rollers to make sure they're able to move smoothly, and inspect and straighten and dents in the tracks to make sure the door can move unobstructed. Longevity is just a phone call away from you. If you want your overhead door to stay in an optimal working condition, go ahead and give our team at Garage Door Repair Carlsbad a call today and schedule a professional maintenance appointment.